I've created this page because my friends are always busting me for the amount of junk I keep in my Ventoux Camelbak. They've recently started calling it the Tardis because I've managed to lose things in there. I use the Camelbak as a training tool for my bike rides. 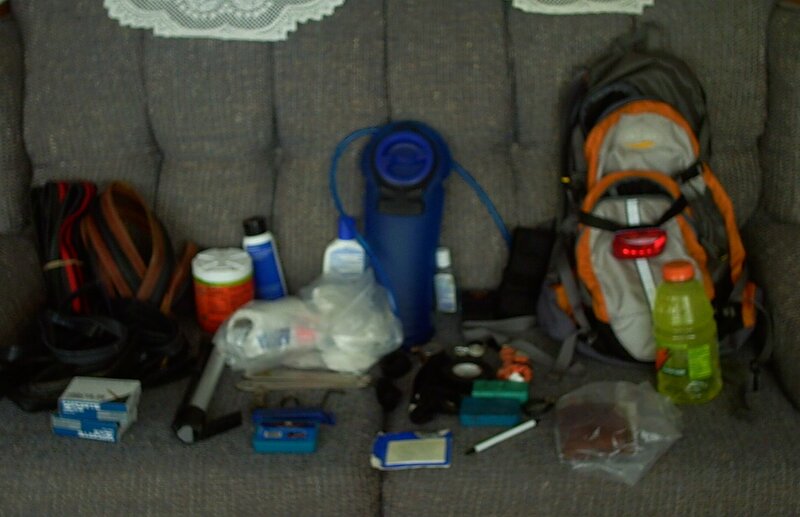 I load it up with just about everything we might need on a ride. Remember I do centuries and there are no bike shops on these routes. 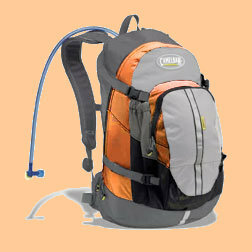 I like the Camelbak system because I don't have to reach down grab a bottle, drink and reach down to put the bottle back. I instead grab the hose, drink and let go the hose. Works very nicely in traffic where weaving can get you in trouble. 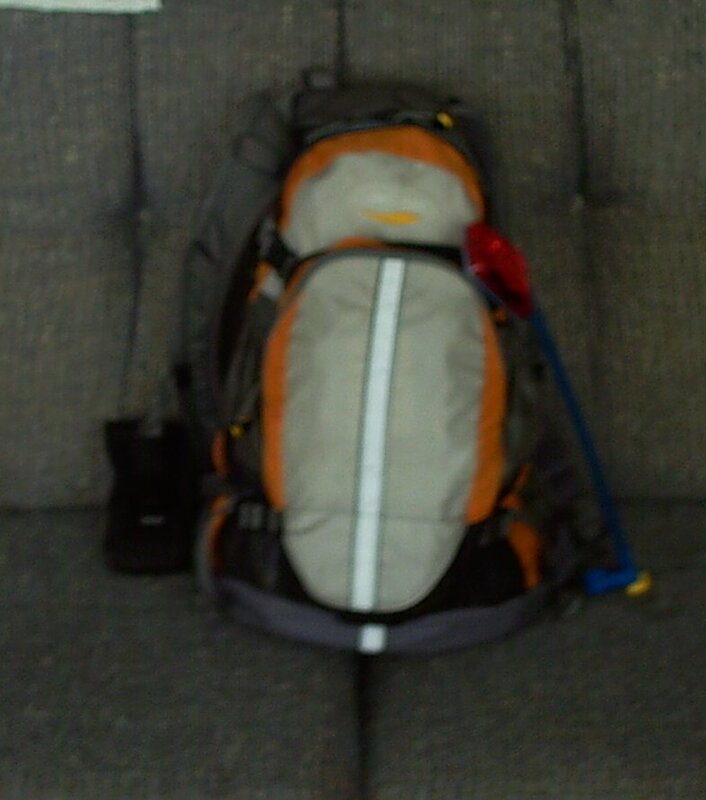 Here's a picture of my Camelbak on my couch. Just click to view the larger image. It's loaded with the stuff from Saturday's ride (except for the my hoagie and the cola which I finished after the ride). Now lets look at the contents laid out on the same couch. , again click to view the larger image. Sorry I'm not that great with a camera and I have them set to be pretty large pictures. Hopefully I'll get better with the camera and I'll try to reduce the picture size for better viewing. The second picture gives a nice view of what I've been carrying. The only thing missing is the loose change. I've been of the habit to dump all my loose change (except for pennies) into my Camelback. At one point I had about 5 fist fulls of coins. We used to joke and call it bail money. :-) Anyway here's the actual list of the contents from front to back and left to right. As I said I just throw everything in and not worry about what's in there. On the Longest Day (and Hillier Than Thou if I do it), I'll unload much of this stuff as it will be in the SAG wagon. Amend that, I managed to leave the Gatorade powder container in there (didn't see it). So i rode the Longest Day with a bit more that I expected. Also I don't know why I have 2 rolls of toilet paper in there. That's just what was in the Camelbak when I took the picture. Lately I've been commuting to work and this Camelbak works well for holding everthing listed above and my clothes, toiletries, towel, etc. It's a 16 - 25 mile ride, depending on which way I go. The on thing it can't carry is my work laptop. I'm testing out another pack for that (I'll review that later). This works well if I leave the laptop at work (locked in a drawer of course).